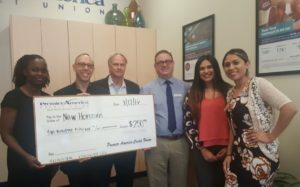 New Horizons thanks Premier America Credit Union for recognizing us for our charitable good works. 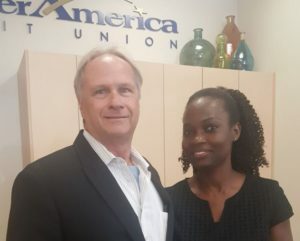 We were nominated for the “Premier America Pay it Forward” award by two previous volunteers, Tim Kaszynski and Mike Murphy, who had worked directly with Shade Mokuolu, our Community Relations Manager. Each month, $250 is given by Premier America to support noteworthy efforts. New Horizons Shade Mokuolu and Ron Silverman accepting the award!